OpeWatlow offers operator interfaces to give users an easy-to-use, reliable and affordable interface to machines and systems. The Silver Series touchscreen operator interface terminal (OIT) is available in three widescreen models (4.3, 7 and 10 in. diagonal display sizes). It supports a full set of features including serial and Ethernet communications with multiple controllers, universal serial bus (USB), secure digital (SD) card, data logging, flexible password security and multi-language support. The EZ-ZONE RUI remote user interface features shallow panel depth allowing it to fit small spaces, the P3T armor sealing system (NEMA 4X and IP66) and programmable EZ-Key, enabling simple one-touch operation of repetitive user activities. The EZ-ZONE RUI’s industrial communications option adds connectivity from a network of EZ-ZONE products to other automation equipment, instrumentation and computer software via DeviceNet™, EtherNet/IP™, Modbus® RTU, Modbus®TCP or PROFIBUS. 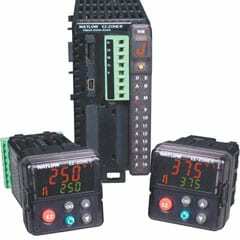 These operator interfaces paired with Watlow controllers are the perfect solution for your industrial process or machine control application. 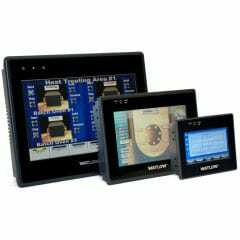 The Silver Series is a rugged, touchscreen operator interface terminal (OIT) available in three models (4.3, 7 and 10.2 inch diagonal display sizes). It supports a full set of features including serial and Ethernet communications with multiple controllers, universal serial bus (USB), secure digital (SD) card, data logging, flexible password security and multiple languages. The small bezel size and nominal 2-inch depth make mounting in tight spots easy. The Silver Series operator interface programming software, EasyBuilder5000, features a large variety of built-in screen objects that makes it easy to use and very powerful. When creating screens, the user can call upon extensive graphics libraries, import custom graphics and add numeric displays, entry fields, analog meters, bar graphs and trend graphs with just a few mouse clicks. Screen objects are highly customizable, and the user can create libraries of their own objects for repeat use. The online simulator, Ethernet and USB support make testing and downloading fast. EasyBuilder5000 is part of the EZware-5000 software suite and is available as a FREE download on www.watlow.com and on the CD-ROM found in the accessories list. The Silver Series operator interface terminal paired with Watlow controllers is the perfect solution for your industrial process or machine control application.